Last month, BioGPS held a plugin registration blitz in order to increase the number of external resources users would be able to add to their layouts. We think the ability to customize BioGPS to suit your needs irrespective of your specialty is a valuable feature; however, this feature is only useful if the right plugins are available. 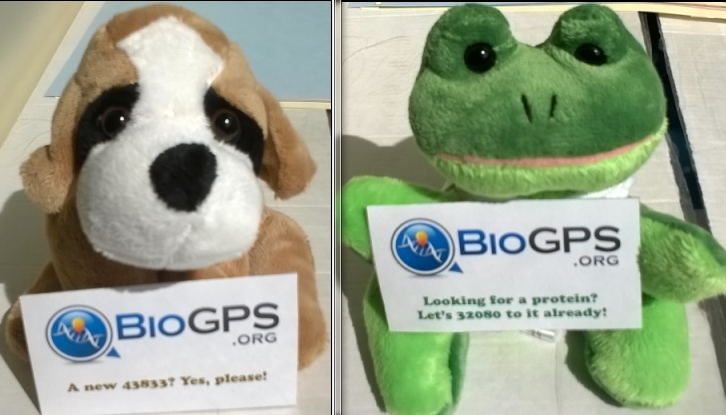 That said, with over 390 plugins already available, only a handful of new plugins were registered during the blitz (ie- we have plenty of BioGPS mascots still waiting to be adopted.) In order to help users find plugins which may be useful to them, we are running the Plugin Review Blitz from now until May 15th. Only one comment per plugin will count for each user. Eg- If you post three comments on the same plugin, it will count as one point. In contrast, if you post a specific, useful comment to each of three different plugins, it will count as three points. The number of points will be used to determine the top contributors and be used to re-home the mascots. In the event that we have many participants with the same number of points at the end of the blitz, the prizes will be awarded to the users who first submitted their eligible comments. Where do we post our comments? here?